This scalloped potatoes recipe is loaded with bubbling cheese, fragrant onion, and sauteed mushrooms. 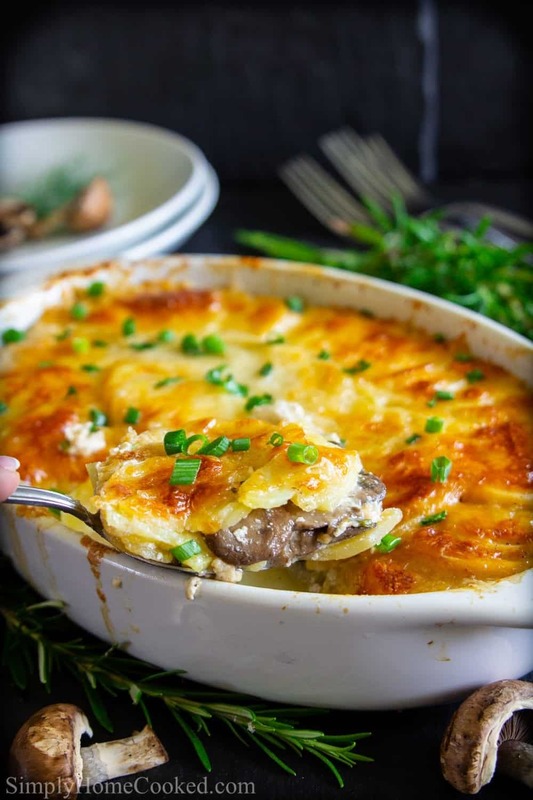 The mushrooms are not necessary but I love how it adds more meatiness to the scalloped potatoes without actually adding meat. If you love vegetarian side dishes, you might want to try making sauteed asparagus, cheesy mushroom pinwheels, and, zucchini fritters. 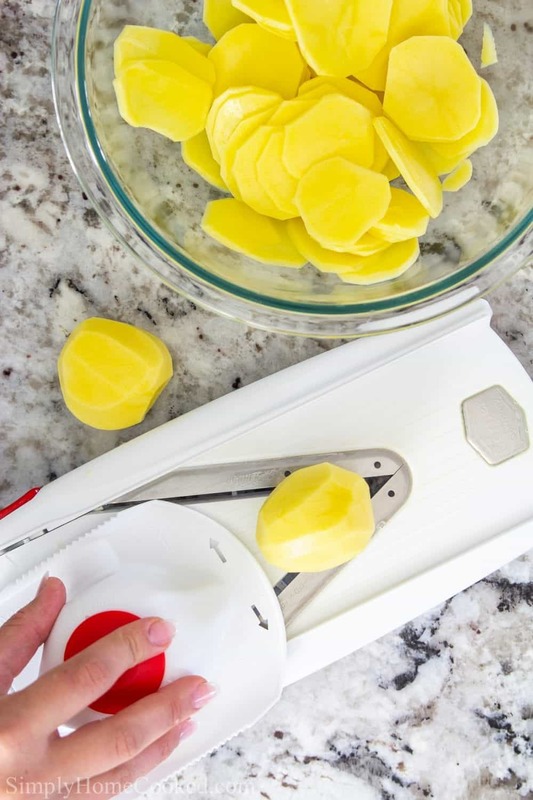 Thinly slice Yukon potatoes with a mandoline or sharp knife. Place the potato sliced into a bowl and season with salt, pepper, and garlic powder. Grease a baking dish or 2 oval gratins with unsalted butter, then add sliced onion into each dish. Then you’ll want to divide half the sliced potatoes between the two dishes. Now go ahead and add the sauteed mushrooms and sliced green onion on top. Next, you’ll want to sprinkle half of the parmesan cheese and half of the shredded mozzarella cheese on top. 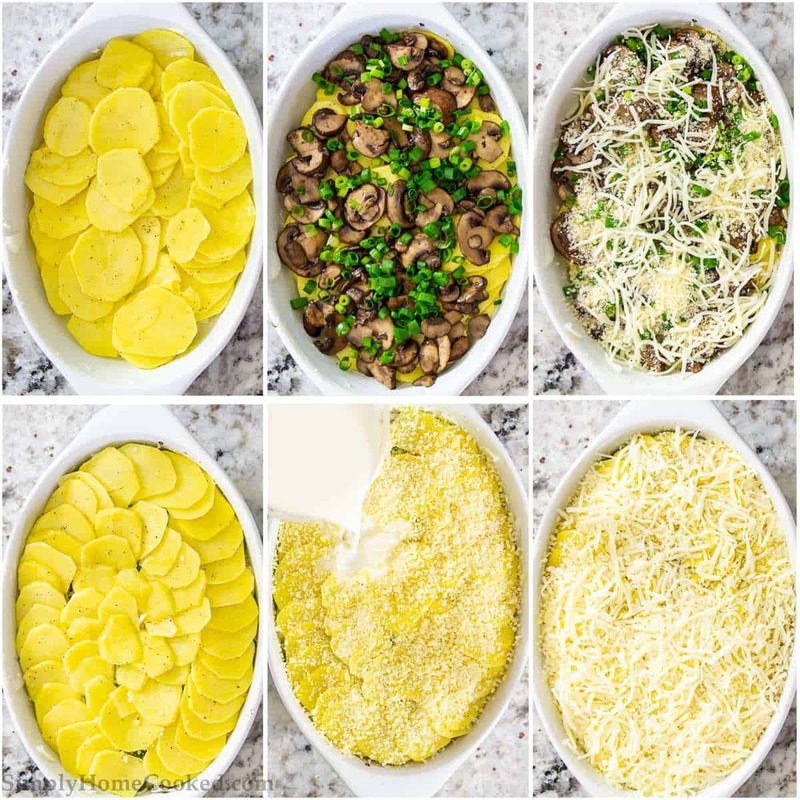 Place the remaining half of thinly sliced potatoes and add the rest of the parmesan and mozzarella cheese along with the half and half. Cover both baking dishes with foil and bake at 400 degrees Fahrenheit for approximately 30 minutes. Remove the foil and bake for an additional 30 minutes. What kind of potatoes are in scalloped potatoes? The most commonly used potatoes are Yukon gold potatoes. You can russet potatoes or even sweet potatoes, but I prefer the traditional version. Unfortunately, scalloped potatoes don’t freeze too well. So I wouldn’t recommend freezing them. You sure can! Just bake them as you would normally. Then let them cool and tightly cover with foil. Refrigerate for up to 3 days then bake (covered) for about 30 minutes at 360 degrees Fahrenheit or until fully warmed through. Ribeye steak– or any other roasted beef recipe. Crown roast of pork– if you really wanted to impress your dinner guests, great for the holidays. The best and easiest way to thinly slice potatoes is by using a mandolin. If you do not have a mandolin, you can always use the blade attachment on your food processor. And if all else fails, a really sharp knife is your next resort. If your knife is dull and you don’t know how to sharpen a knife, this knife sharpener is my best friend when it comes to that. 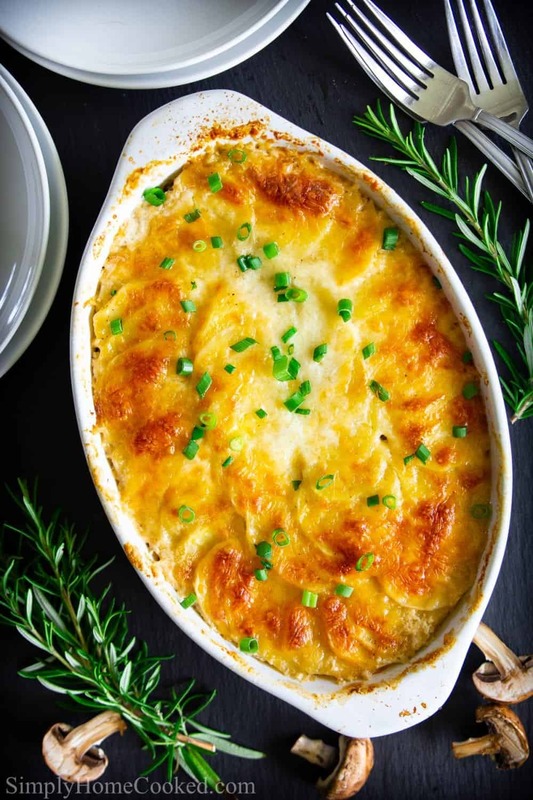 Classic cheesy scalloped potatoes with a twist. Adding mushrooms gives it more meatiness without actually adding meat. In a large skillet, sauté 16 oz of sliced mushrooms until they become tender. Using a sharp knife or mandolin, thinly slice 16 Yukon potatoes. Place the sliced potatoes into a bowl and season with 1 1/2 tsp salt, 1/2 tsp black pepper, and 1/2 tsp garlic powder. Generously grease 2 baking dishes or oval gratins with unsalted butter. Then add the sliced yellow onion to both dishes. Now divided half is the seasoned potatoes amongst the dishes. Slice the green onion and place it on top of the potatoes. Then add half of the Parmesan and mozzarella cheese. Now add the second half of the sliced potatoes. Lastly sprinkle the remaining parmesan, mozzarella, and pour the half and half right over the potatoes. Cover with foil and bake at 400 degrees Fahrenheit for about 30 minutes. Then remove the foil and bake for an additional 30 minutes. This is so delicious! My family is a fan of potatoes, this should be exciting to make! Thank you for sharing! Hi there, I have a couple questions. First, if I wanted to add chicken, would I add in raw chicken or partially cooked? Would the time in the oven stay the same?